What an interesting week we're heading into! In rhythm with the Moon's renewal cosmic gears will be shifted, a major transition is knocking on our doors. 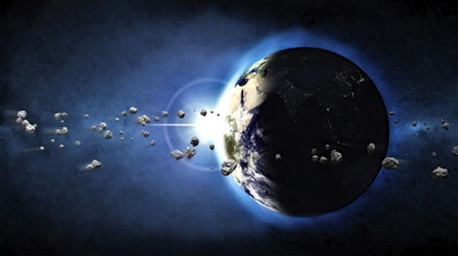 In quick succession within three days, three planets and two major asteroids will change direction, opening the curtains for new scenes, transporting us to a different climate zone. On February 27, dwarf planet Ceres will initiate the round. Mercury, Mars, Vesta and Saturn are following suit. This time earth goddess Ceres seems to play the main character. She's the figurehead of a potent planetary team, endorsed by the Lunar North node. This group consists of Mars, Vesta and Ceres. They're meeting in hexagram 50, The Cauldron, representing harmonization and stability. This hexagram speaks of internal cultivation via external burning. We're blessed when we find ourselves motivated and committed, when given the chance to serve a superior purpose. The hexagram's guidance says: "The Cauldron is stable and well-balanced. Good fortune. Everything goes smoothly." The cauldron was used for cooking royal feasts, offerings were made to the heavens and to one's ancestors. Showing the universal spirit of humanity, these gifts express people's harmonious relationship with the spiritual world. They are signs of deep gratitude for the good life we're enjoying together. In celebrating, everybody receives a fair share of the contribution, cherishing the feeling of being part of one big family. 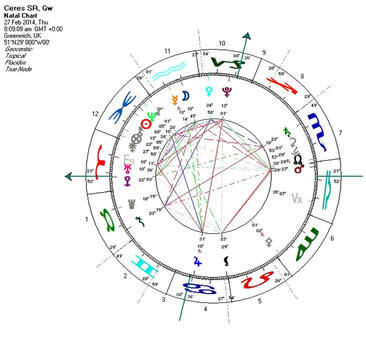 Precisely two days prior to New Moon, Ceres reaches the pinnacle of her yearly journey. 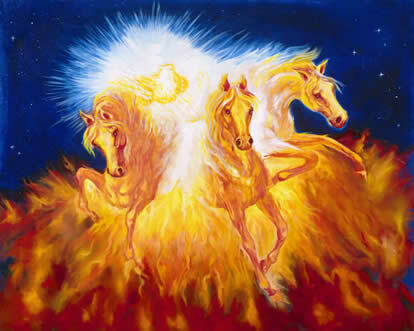 The Moon is back in the eleventh degree of Aquarius, where on January 30 the Year of the Wood Horse was set in motion. Ceres is the goddess of harvest, in Greek mythology she's known as Demeter. She symbolizes unconditional motherly love. 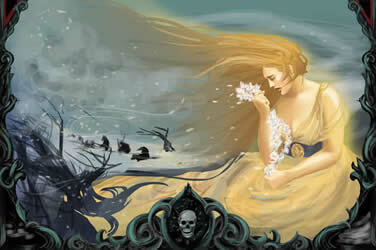 However, as the story goes, Hades the Lord of the Underworld abducted her daughter Persephone. Consumed by deep sadness Demeter is heartbroken and falls into depression, neglecting her assignment of caring for life on earth. In the depth of her despair she fails to do her chores. Helios, the sun god, seeing everything eventually enlightens Demeter of what had happened and she discovers the place of her abode. Pressed by the cries of hungry people and by other deities stirred by the anguish, Zeus is forcing Hades to return Persephone. Hades complies with the request. However first he tricks Persephone, giving her pomegranate seeds to eat. Because of this she's obliged to spend one third of each year in the Underworld. Over and again when her daughter has to leave, Demeter's neglect turns nature into a barren and inhospitable desert. Only a few weeks ago the European Space Agency released the exciting news that Ceres, the largest member of the asteroid belt might contain more freshwater than all of planet Earth. Shy of 1000km in diameter, Ceres therefore must be covered by deep oceans which remain solidly frozen for most of the time. Only when coming closer to the Sun her surface is warming up, causing water vapor to shoot out. Ceres' myth shows deep ambivalence, swinging between powerful emotions. Now as we know that she's a water planet the observed mood swings can be understood. As deeply caring and loving as she is, the moment she's struck by grief she gets paralyzed, all her light switches go off. Hence whenever Ceres plays a prominent role we should be prepared for extremes, knowing that we might get thrown from red hot to ice cold at any moment; from intense care to spells of abandonment and neglect. Vesta is the other asteroid goddess teaming up with Mars. She's known to follow her inner voice, worshipping higher principles, dedicating her energy to pure and noble causes. Vesta is intelligent, versatile and intensely focussed. The main belt asteroids forms the bridge between personal and collective, between individual and transpersonal worlds. Mediating amid these two realms, the asteroids are linking the inner and the outer. They invite us to reach out and interact, to join the drama; making best use of costumes and masks provided. When ready to participate we may find ourselves at the center of the spectacle, giving expression to our concerns and emotions... simply because we feel the urge to convey love and gratefulness. A few years back I read the book "The Rational Optimist". Author Matt Ridley presents a brilliant and profound analysis of thousands of years of history. Defying voices of gloom and doom, he points out that humanity never's been better off than we are today. Based on his extensive studies, Ridley demonstrates that humanity made it through many disturbing and difficult times. Forced to adapt to unprecedented challenges, oftentimes our ancestors came up with radical solutions, not only resolving crisis but opening perspectives for ground-breaking new developments. Facing the inevitable releases adrenaline, which pushes our intelligence to new heights. Once difficult situations are fully embraced, solutions are bound to surface. This historic pattern is promising, so let's hope that this time too we will be able to pull through and emerge at the other side of the tunnel stronger and more integrated. Of paramount importance is recognizing looming threats. An honest assessments is urgent, before it's too late to change the course of the ship. We need the adrenaline rush. Without it we won't be able to give our best and awaken to the unwavering determination and pull the wheel around. However, it's about the journey and not the outcome. Weve arrived when every moment has become the destination.